DEARBORN: People, Pitas & Pastries…. Let’s face it: The car put Detroit on the map. We are all familiar with the Big Three, Henry Ford, the Fisher and Dodge brothers and Walter P Chrysler, but there are many others who made significant contributions to the auto industry that you may not be so familiar with. Today we will visit the Automotive Hall of Fame in Dearborn; here we celebrate the people that made the automobile great. 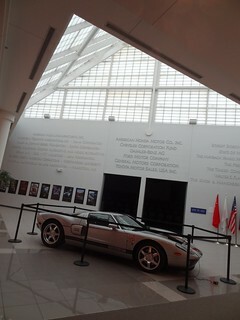 Located on Oakwood Blvd adjacent to the Henry Ford Museum this 25,000 sq. ft. building opened in 1997. 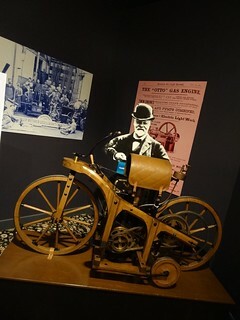 The museum honors the inventors, engineers, stylists, manufacturers and dealers whose inventions and innovations and creations literally changed the world. 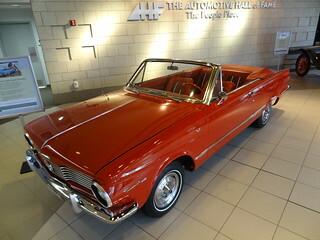 In the lobby, I proceed to the desk to purchase tickets, Kris is immediately drawn to the red convertible Valiant Signet parked to the right, this is one of about 10 cars on display. He takes a few photos then we continue on to the Hall of Honor, a huge mural draws our attention. 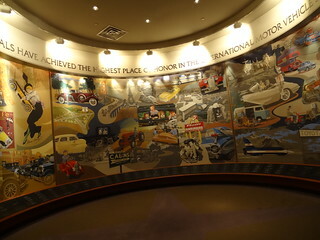 At 11 ft high and 65 ft long, the painted images show us the impact the automobile has had on the culture of the world. With the invention of the car everyday people experienced new freedom and mobility, changing the way we live, work and play. 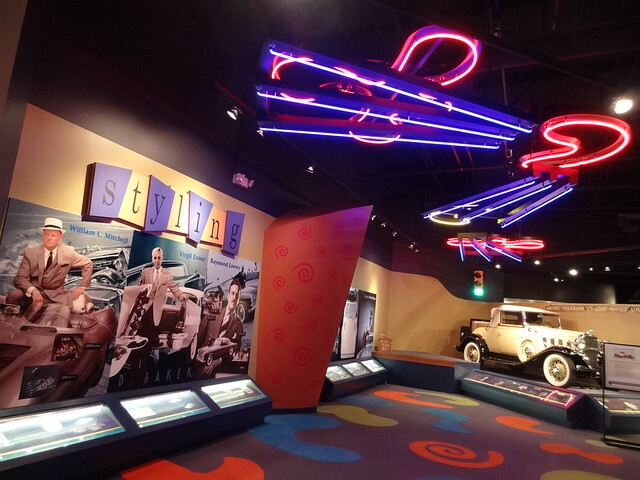 The exhibit area is in a timeline format starting with the earliest forms of transportation. Cameo photographs enable us to see the faces that go along with the innovations. The names are well-known, most became major manufacturers; Vincent Bendix produced his own brand of motor buggies, he developed the electric starter drive in 1914, then introduced the first reliable 4-wheel brake system, here’s where you go ah-ha, Bendix Brakes. Clarence Spicer developed the Universal Joint and founded Dana Corporation, Warren E Avis founded Avis Rent-a-car in 1947 at both Willow Run and Miami International airport. 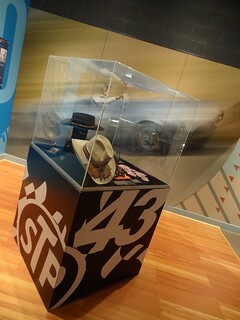 Exhibits are user-friendly, lots of actual items on display from an early gas engine to a couple of Richard Petty’s hats. There are some great stories here; Alice Ramsey was the first woman to drive a car across the US from New York to San Francisco. She made the trip in a Maxwell Touring car; it took her 41 days and 11 tires to make the 3,800 mile trip back in 1909. C Harold Willis worked for Henry Ford and was responsible for designing the famous Ford script on the company emblem. He went on to start his own company Wills-Sainte Claire. Carl Fisher founded the Indianapolis Motor Speedway in 1909 and originated the concept of a coast-to-coast highway. 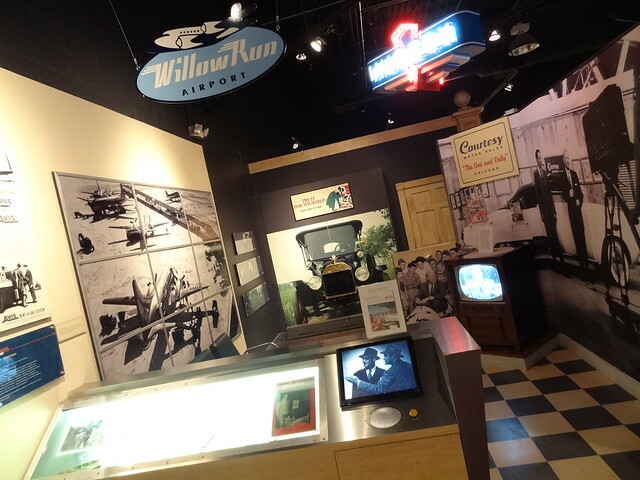 The Lincoln Highway was America’s first cross-country highway. America was a blank slate, the combinations of all these men working together eventually created the world we live in today. When you are in the mood for excellent Middle-Eastern food, you come to Dearborn! We were famished so we headed to New Yasmeen Bakery on Warren Ave. 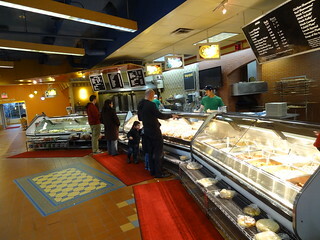 The interior is divided into three sections; bakery, prepared food and dining area. We made our way to the prepared food section, two large counters are filled with hot selections and another one with cold items like baba ghanouj, hummus, vegetarian grape leaves, lentils and fatoosh. There are several workers behind the counters eager to help, we select a scoop of this and a scoop of that, a few grape leaves, then move on to the warm food. The meat pies here are awesome, you have to try them, we get two. A spinach pie, and one with cheese and something else, a few falafel, some pita and we are set. We pay at the register, grab some napkins and plastic silverware and find a seat. Very little conversation takes place, instead we dip our tender slices of pita into thick and creamy hummus, I eat my meat pie with my hands, nobody seems to notice. Some of this, a bit of that and soon our plates are empty. 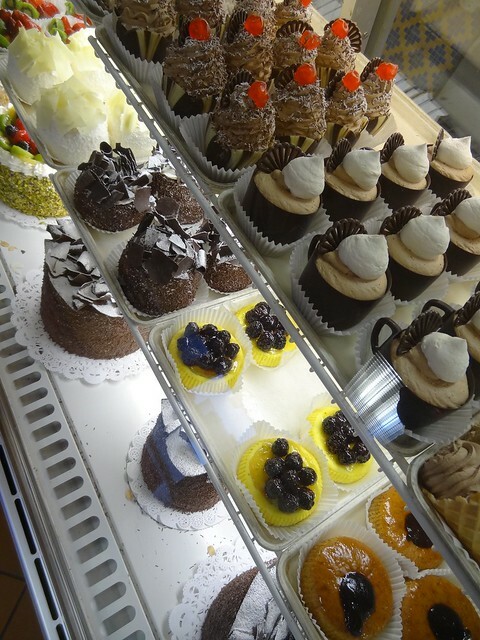 There is no need to drive anywhere for dessert, the bakery has some of the best pastries in town. 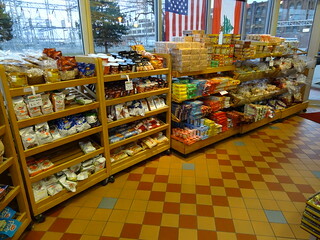 I am sidetracked by the racks spilling over with fresh-baked breads. I select a bag with 4 loaves of date-filled yellow colored bread, it has a sweet scent. I can’t resist the shelves loaded with imported cookies and candy bars, have you ever seen a hazelnut or peanut butter Kit Kat bar? Kris is at the pastry counter taking photos, I join him there. A small section is devoted to cakes and tortes, although they are pretty we are here for more traditional sweets. Tempted by the piles of honey-soaked dough in different shapes, we choose what looks to be a turnover-type pastry with cheese and pistachio filling. I ask the man behind the counter if he likes this kind and he smiles. He places the pastry on a styrofoam plate, then spoons a thick clear syrup over top…..I better grab a few more napkins. As expected the pastry was delicious, the syrup adding a floral sweetness, the perfect ending to a delicious meal. In this area of Dearborn you feel completely removed from Detroit, it is a world all its own; come check it out!